Saturday Night Fever is SO 1976! 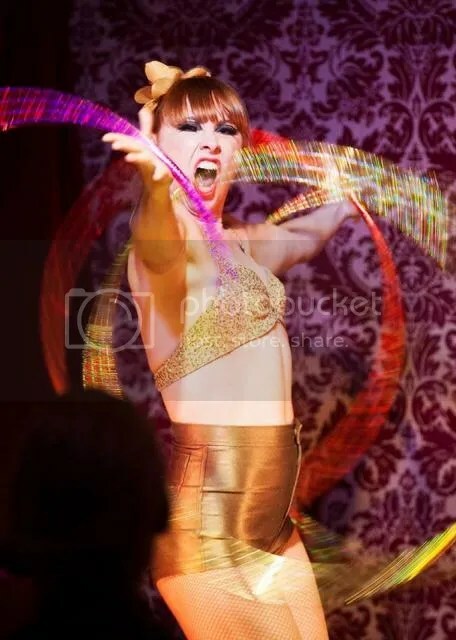 It’s all about Sunday Afternoon Fever here at Dr Sketchy’s and we’re welcoming back the globe hopping, hooping sensation Anna Lumb Artist Page! Summer 2010 Anna Lumb skated, hooped, bounced and pranced across the Dr Sketchy stage. She’s back. AND NOT ALONE. Anna is 7 months up the duff! This will be a session full of hoops, heels, bottles of bubbles, bellies covered in Lycra and DISCO! Anna explodes onto stage with her charismatic and cheeky performances. Earning her vaudevillian stripes on the cabaret circuits of Melbourne, London and Edinburgh she has appeared in a whole host of variety shows including ‘Ali McGregor’s Late Night Variety Night’, ‘Frank Skinner’s Variety Show’, ‘The Last Tuesday Society’ cult performance night, The Supper Club and more more more. She has hooped up a storm with Peaches, performed for Prince Edward and the Royal Family of Jordon. Anna has a list of opriginal shows to her name including most recently, “Kissing a Stranger” at La Mama Theatre, “I heart Jack” and her first solo show ‘Big Shoes to Fill,’ a critically acclaimed audience hit at the Melbourne and Adelaide Fringe Festival and Melbourne International Comedy Festival.